Meet Former Colorado Governor Hickenlooper (and brewery co-founder and Presidential Contender) at the Brewery on Saturday, March 23 from 12:30-1:30 PM! Our Four Rivers Red Ale is back on tap and for the first time available for sale in 16oz cans at the brewery. It is a session (low alcohol) New England style IPA that is completely crushable. It is hazy, juicy, light and crisp and available in the brewery on tap and in 16oz cans. Come in and meet our Ballot Box Brut IPA. A brut-style beer with a dry finish like no other. While supplies last we will have our Ballot Box Brut on draft and in 16oz cans at the brewery. We have 9 beers on tap and 8 in cans at the brewery, including our Safe Space, The Gov'nah, Senatah, Kapitol Kolsch, Town Pound Porter, Ballot Box Brut, Four Rivers Red, and Wayfarer Coffee Stout. You can find a retailer near you on our "Beer Finder" tab. We are hiring servers in Tasting Room. Concord Craft Brewing Company is a small batch craft brewery with a retail beer store and tasting room, where beer enthusiasts can walk in and sample the current beers on tap, take a brewery tour, or take a look at the cool beer gear in our swag shop. Our beers may be purchased in 16oz or 25.4oz cans or a variety of growler sizes in our brewery store, at retailers, bars and restaurants around the state. Our location sits among restaurants and shops in the newly renovated, historic downtown district of Concord in the former Merrimack Farmers Exchange building that houses our state of the art 15-barrel, steam-powered brewery. 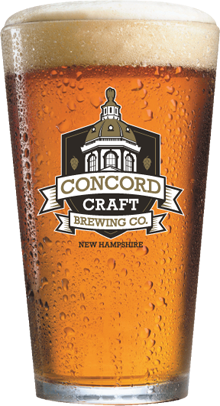 We started Concord Craft Brewing to bring great beer to New Hampshire. We use only the best all natural ingredients and brew it right in downtown Concord. Our beer is delivered cold and fresh to the best restaurants, bars and selective retailers in New Hampshire. It costs more and takes a little longer to use the best ingredients, pack each pint with flavor, and keep the beer cold from carbonation to kegerator, but we think you will taste the difference. That’s LOCAL FLAVOR. We brew a range of beer styles, but in every case we aim to deliver a full, well-balanced, clean, fresh flavor for your enjoyment. We think it is OK for lighter beers to have a little more flavor and bigger, darker beers to be bold, but we always aim for balance. All of our beer styles will be on tap fresh at our beer store and tasting room, while select styles will be served fresh at your local capital area restaurants and bars, or in cans at selected retailers. Because we think all beer should be enjoyed fresh, we distribute our beer cold to discerning retailers, restaurants and bars in New Hampshire. We post current release dates at the brewery and on-line on the "Our Beers" tab. Please visit our "Beer Finder" page to find out where some of New Hampshire's freshest beer is being served near you.